Basement renovations have different forms and sizes. Some remodeling ideas are huge while some only require minor and trivial changes. Whether you are getting a major makeover or just little alterations here and there, remodeling your basement is no doubt a practical and lucrative decision. Basement renovations are designed to maximize the full potentials of your home specifically its square footage. There are exciting ways to transform your basement, specifically when turning it into a home theater and private bar. Basements are the ideal place to enjoy a private time for relaxation and whatever it is you want to spend your time for. Modern basement remodeling ideas vary from one personal need and preference to another. It mainly depends on what you wish to achieve in your basement renovations the type of room it will be converted into. New basements could be anything you want it to be, including a great home theater and media room. If you love movies but you hate the crowds in the cinema, it is high time you have your very own home theater, complete with all the amenities to make the experience exceptional. Hire professional basement renovation contractors to help you do the job and make your dream room come to life. Whatever theme you have in mind, the experts can help you visualize and put your visions into reality. Home theaters and media rooms are the ideal spots where you can have a private moment or spend quality bonding time with the entire family. 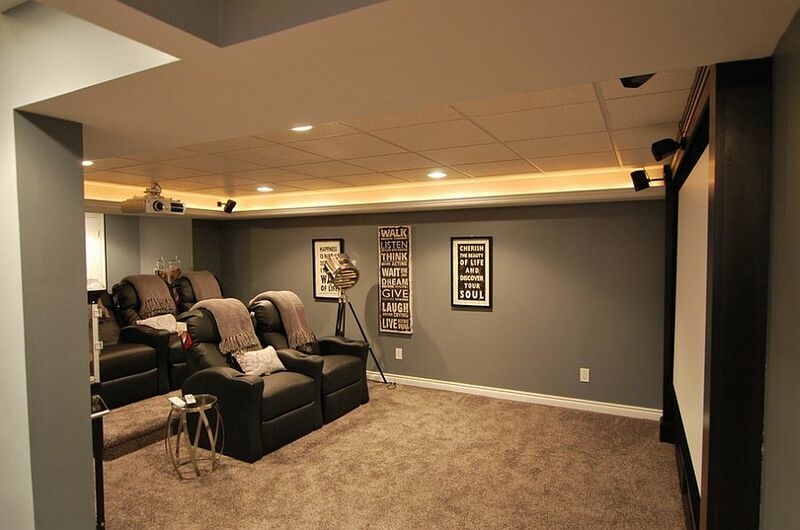 Use the home theater in the basement to watch the playoffs or simply enjoy a movie night with family, friends, and loved ones. The possibilities are endless when you have a new home theater right in the comfort of your home. How’s a Private Bar Sound? On top of a home theater, other exciting ideas for basement renovations include a private bar where you can enjoy your favorite glass of drink or two. There are different designs to choose from such as a classy and elegant lounge or a vintage-designed private drinking station. From mild to wild, a great basement bar is perfect for party-lovers like you. You can also have an adjoining division in the basement where you can keep your wine collection hence a wine cellar for an additional boost. Indulge in luxury with the best basement renovations such as turning this once neglected space into your newest home spa or home gym. This idea is perfect for health buffs who want something private and an easy access, that means not leaving their home for their next workout regimen or spa appointment. Basement renovations make a world of difference in your home improvement project. There is nowhere else more spacious than the blank canvas that is your basement. Transform their place and make it a new room of your choice. Your imagination is the limit with new remodeling designs for basements.